Roast duck is a classic autumn favorite, but riddled with a lot of duck fat and more than a few literary guilt trips for our culinary maven. Duck with Apples appears in every major Russian cookbook from Elena Molokovets through William Pokhlebkin and even makes an appearance in the exhaustive Soviet culinary bible, "The Book of Tasty and Healthy Food." And it's no wonder. Ducks are plentiful in most parts of European Russia, the autumnal tradition of shooting and hunting wild game has always been popular, and, from both a seasonal and a culinary angle, duck and apples go together like caviar and blini. There are lots of literary references to hunting and eating duck with apples: in Anna Karenina, Turgenev's Hunter Sketches, and in Chekhov's short stories. To tell the truth, duck is probably far more ancient a recipe for Russians than any parvenu dish such as Veal Orloff or Beef Stroganoff. For the pagan Slavs ducks were a lucky symbol of both a messenger and a husband, and we know that this remained in the early Christian era: 9th Century Slavs still had ducks on their radar screens, as we can readily discern from the exquisite mediaval duck-shaped drinking vessels in the Armory Chamber and the fact that this shape has endured to our present day in traditional Russian khokloma lacquerware and embroidery. There are excellent reasons not to attempt duck. Many of mine are literary: Ping, Jemima, and Mr. and Mrs. Duckling make duck an almost unbearable guilt trip. Then there is the guilt associated with the price, which is fairly exorbitant for something with so little meat on it. And, of course, there is the fat issue: although a useful culinary commodity, the staggering amount in just one duck often renders dishes impossibly greasy. But duck was on my mind, and tart apples are currently in season. It had been a long time since my only other attempt to make a whole duck. This had been marred by a slightly sinister poultry salesman at Leningradsky Market, who nimbly slipped me a duck with hundreds of quill tips still embedded in its flesh when I was looking the other way. I spent half the night with a pair of tweezers trying to finish the plucking job he swore he had completed. This time, I took no chances, purchasing a French duck wrapped in clear cellophane from the exotic meats counter at Dorogomilovskiy Market, where (hopefully) I’ve earned enough respect as a serious client after years of splashing out on Australian beef and French quails eggs. No Russian cookbook dealt with the fat problem. I could only find this helpful suggestion from nineteenth century master cook Elena Molokhovets: “…any leftover fat…may be given to the servants to be eaten with their kasha.” This was an intriguing idea, but nothing I’d ever attempt with Raisa, our housekeeper. Finally, I stumbled upon an interesting suggestion from Mark Bittman in his authoritative “How to Cook Everything.” He suggested a double-dip approach: scoring the skin of the duck with a sharp implement all over, then steaming it for a good 45 minutes before a quick roast in a hot oven. This proved an excellent method, allowing the duck fat to turn to liquid and run out of the bird. The result was a crispy skin, enveloping delightfully juicy and flavorful meat that wasn’t drowning in a Lake Baikal of duck fat. I used a little of the extra duck fat to coat the potatoes before roasting them in the pan with the duck. The rest of the fat, of course, I tucked away in the back of the fridge, because you never know: someone might like it with their kasha. 1. Wash the duck thoroughly in cold water, removing any excess fat from the body. Use the point of a small knife or the tines of a fork to prick the skin of the duck all over. 2. To steam the duck, use a large Dutch oven or stockpot with a steaming basket or colander placed inside. Fill the pot so that the water does not touch the bottom of the steaming basket. Place the duck inside the pot, cover, and steam for 45 minutes. 3. 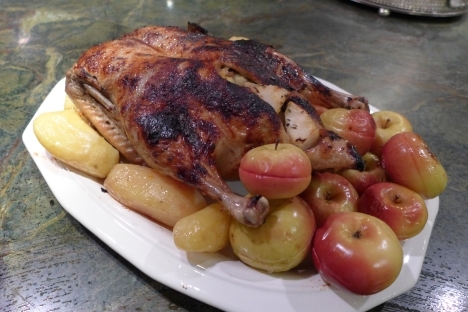 While the duck is steaming, prepare the potatoes and the apples, tossing them with lemon juice so that they do not brown. Use a small paring knife to score the smaller apples all around, leaving the core intact. 4. Combine the orange zest, ginger, and honey in a small sauce pan and simmer until it reaches the consistency of syrup. 5. Preheat the oven to 375°F, adjusting the rack to the middle of the oven. 6. Remove the steam duck from the pot and let sit on a cutting board for 15 minutes to cool. Decant the steaming juices and duck fat into a non-reactive glass container. The duck fat will rise to the top of the container. 7. Line a roasting pan with parchment paper. Pat the potatoes dry with paper towels, then toss them in 2 Tbl of the duck fat and season generously with salt and pepper. Place these in the roasting pan and cook in the oven for 15 minutes. 8. Combine the chopped apples, horseradish, caraway seeds, and marjoram and toss. Generously salt the inside of the duck, then stuff the apple mixture loosely into the cavity. Either sew closed with poultry string or fasten with skewers. VIDEO: How to buy the best products at the Russian market? 9. Place the duck, breast side down, on a rack set above the potatoes in the roasting tin. Baste the duck the syrup then place in the oven. Cook for fifteen minutes. 10. Remove from the oven and flip the duck on its other side (breast side up). Baste this side generously with the syrup. Place the smaller, whole, cored apples in the roasting tin along with the potatoes. Raise the oven temperature to 425°F, then cook for another 15-20 minutes, or until a meat thermometer registers 165°F. 11. Remove the duck from the roasting tin and place it on a carving board. Use tongs to remove the smaller apples, and tent both with foil for 15 minutes. While the duck is “resting,” toss the potatoes in a final Tbl of duck fat and sprinkle with salt, then run them under the broiler for 10 minutes. 12. Carve the duck and serve immediately. Cooking technique from Mark Bittman’s How to Cook Everything.